I’ve just taken delivery of a Deadcameras Slim Strap and I will say here from the outset that I am very pleased with it! I have used an Artisan & Artist black silk cord with my Leica MP for the past 10 years. 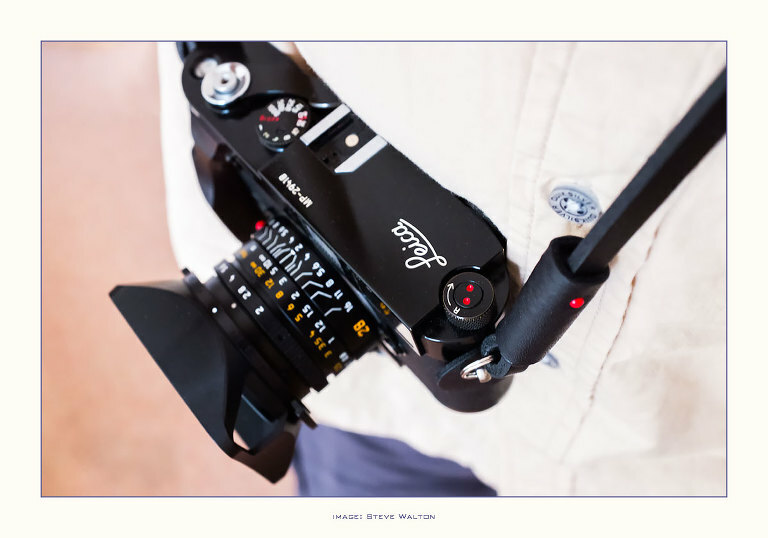 It’s a versatile strap that can be comfortably wrapped around my wrist for carrying the camera but the MP is too heavy to carry all day this way, especially with a substantial lens attached. As a result of rugby injuries and a couple of car accidents I don’t like hanging cameras around my neck, I find it very uncomfortable. I also find it annoying, the camera always seems to be in the way. My preferred method of carrying cameras is by the cross-shoulder method. I carry my working cameras this way on a variety of Peak Design and Sun Sniper straps. The main problem I have always had with the Artisan & Artist silk cord is that it is too short for a cross the shoulder carry, so I have been looking at alternative straps for a while. With my Nikon and Fuji work cameras, Peak Design straps are probably the best around. They are quick and easy to attach and remove but they did not work at all well with my Leica MP. The metal attachments on the ends of the straps clattered against the brass on my MP rather more than I was prepared to put up with. I’m not overly precious about brassing, scuffs and scratches, but I would prefer that through normal travel and usage rather than from a camera strap. 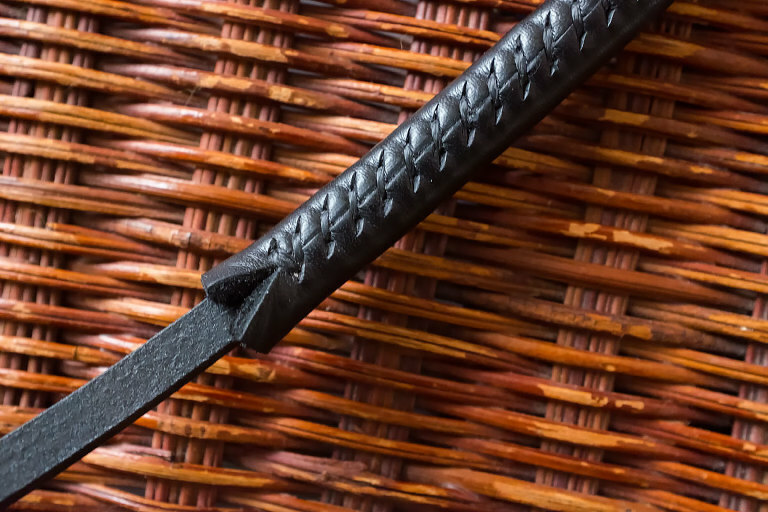 Artisan & Artist have risen to length issue by producing a longer version of the silk cord strap along with their Easy Slider series, but I really wanted a complete change to a leather strap. A few minutes’ internet searching brought up Deadcameras’ website and I really liked the look of their products. Deadcameras prices are fairly reasonable compared to some other cottage industries whose target audience are Leica owners but it was good to see the workmanship and materials are obviously top-drawer. After a bit of experimenting with my Peak Design Leash , I worked out that 125cm would be about the right length for cross shoulder carrying with a non-adjustable Slim Strap. At 6′ tall with a 44″ chest , I am not a lightweight and determining the correct length is critical, too short would leave me with a long short strap and too long would mean the strap would be cumbersome. Deadcameras offer a number of length options for the Deadcameras Slim Strap in their ordering system and special requests can be accommodated, but a litle thought needs to be applied before ordering. Long straps can be bulky so I decided to order a 125cm Slim Strap in black with red dots. The online transaction was very efficient and there is good automated communication by Deadcameras. As a customer, I was made to feel that my business was appreciated. My new strap arrived within one week, well packaged with a bag, spare leather protector disk and spare red dot. The length is good, the camera sits just above my right hip, exactly where I wanted it and can be either pushed round to my back out of the way or brought to the front for security. There are other choices of leather, colour, thickness of leather, width, shoulder/neck pads etc. 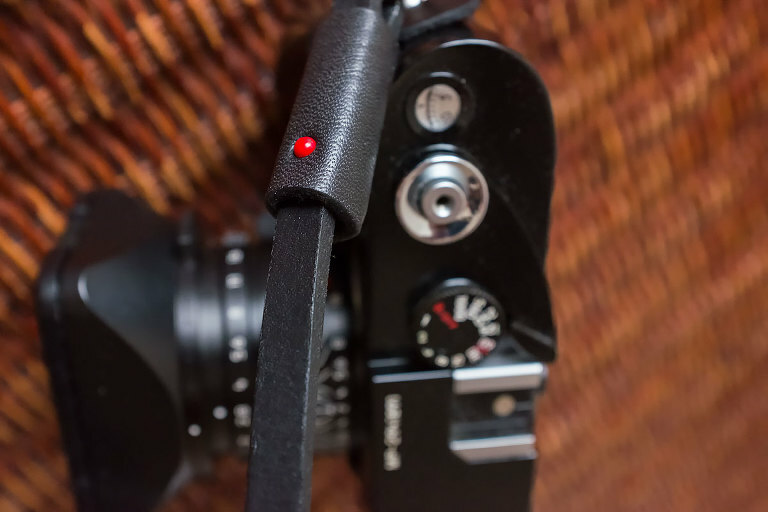 I think the Slim Strap matches my Leica MP very well, it is discreet and not bulky and a perfect solution as a top quality cross shoulder leather strap. I really dislike the big red dot on the front of some Leica cameras, but the red dot on the Deadcameras Slim Strap is somewhat understated and complements the red lens alignment and wind-on indicator dots on the MP! €59.80 including postage from Portugal, with spares! Even with the current sorry state of the £ against the €, this is not bad value when compared to leather straps from some other manufacturers. It’s a thick strap, unlikely to break in normal use, the thickness of the leather means the new strap is quite stiff, but I think it should become more supple with use. Deadcameras offer a selection of different coloured accent dots. These are purely decorative, I decided on red as a contrast with the black leather. A spare dot is supplied with a spare leather disc to protect the camera body from abrasion. Nice touches by Deadcameras, little things show that this company thinks about it’s clients and it’s products. The soft calf leather shoulder pad is a good length to reach from collar bone to shoulder blade. Being so soft and supple, it acts as padding without adding weight and bulk to the strap. The design of this strap has been thought about very carefully, the stitching is accurate and the overall construction exudes quality. The choice of materials and workmanship is exemplary. The Deadcameras Slim Strap has very clearly been created by someone who is very skilled in their craft. The disc of soft leather to protect the camera from the split ring is useful, the leather of the strap is thick enough to give ample clearance between the split ring and the camera body, but being quite hard and stiff leather the strap could wear the black lacquer. Accurate and beautifully finished stitching with thoughtful touches completes a great quality leather camera strap from Deadcameras. It’s always good to find something that matches or exceeds expectations and that’s why I can recommend the Deadcameras Slim Strap. The good choices of materials , the very high standard of manufacture and the nice touches with the spares and user-friendly website is a good policy on Deadcameras’ part. This company has identified it’s target clients, thought carefully about it’s products and it’s branding and hit the ground running to build an instant reputation for top quality and service. 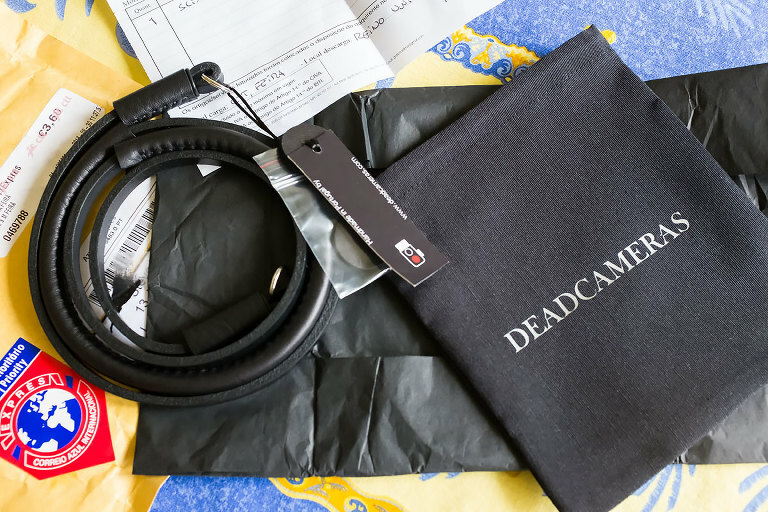 Deadcameras have a great range of well thought-out, beautifully crafted products and I will certainly be a repeat customer!